In 1854, a fossil was found on Prince Edward Island by a farmer. It was part of an upper jaw with curved teeth. It was given the name Bathygnathus borealis. The 290 million year old Permian period reptile couldn’t be identified, and it wasn’t linked to other species that are now known. However, looking at the fossil again, scientists discovered that it’s actually a Dimetrodon. 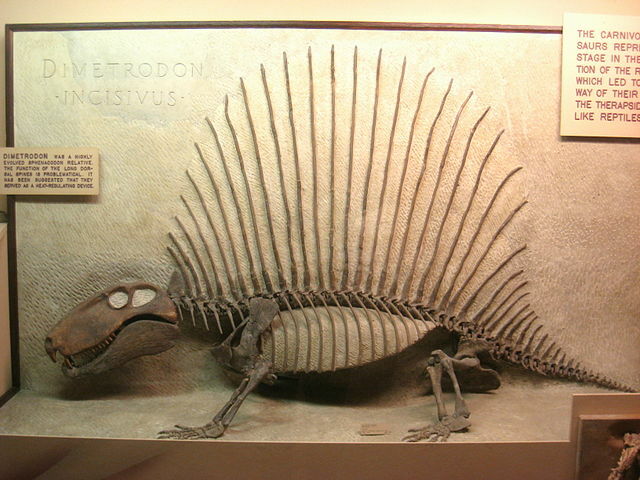 Dimetrodon incisivum at the Museum of Natural History in the United States. The Dimetrodon is a famous sail-backed reptile that predates the dinosaurs. They are not related to dinosaurs, but are in fact more closely related to mammals. They come from a group of reptiles called non-mammalian synapsids. While they aren’t our ancestors, another reptile from that group is our direct ancestor. I find this pretty interesting. Dimetrodons had never been found in Canada before, so it’s nice to add such a famous animal to the list of prehistoric animals that lived in Canada. What do you think of this news? Ever wonder where you could go to see dinosaur fossils in Alberta? Well, here’s a list of places you can see plenty of them. Probably one of the best places in the world to see dinosaurs, this incredible museum in Drumheller is one of my favourite places. It’s in the heart of the badlands, an amazing treasure trove of dinosaur fossils that you can even go out and look for yourself. There are tours available where you can help dig up dinosaur bones for 90 minutes at a time. The museum itself has a huge number of skeletons and fossils on display, and well worth the visit to this town. Near Grande Prairie and my hometown of Beaverlodge is this new museum set to open this fall. It’s located near the Pipestone Creek bone bed, which has unveiled a few different kinds of dinosaurs, many of which still have to be excavated. Phil Currie has also been very instrumental in the Royal Tyrrell Museum, and is a palaeontology professor at the University of Alberta in Edmonton. Located in Edmonton, this is one of the largest museums in Alberta, and it does have some dinosaurs on display. Although not as impressive as Royal Tyrrell’s collection, it’s worth seeing this museum, mainly because of its very good natural history exhibition. This museum is actually going to be closing soon, but will reopen in downtown Edmonton in late 2017 or early 2018. It will be western Canada’s largest museum. Located southeast of Lethbridge is this museum dedicated to the local finds, especially hadrosaurs. Though not well-known, this is probably worth a visit, especially if you want to see some dinosaur eggs. These are the main museums throughout Alberta with dinosaur fossils, but there are other attractions related to dinosaurs. I’ll cover them another time. But if you want to see dinosaurs, Alberta is one of the best places in the world. Today, we were in the Keikyu Department Store in Kamiooka, Yokohama, and we did some shopping and lunch. But then we found out there were some dinosaurs in the building. We had to check them out. In fact, on the floor we ate on, there was a Stegosaurus skeleton. I didn’t get a picture of it, mainly because it wasn’t easy to get a good view of it. However, we found out there were other skeletons on other floors. We went to seek them out. 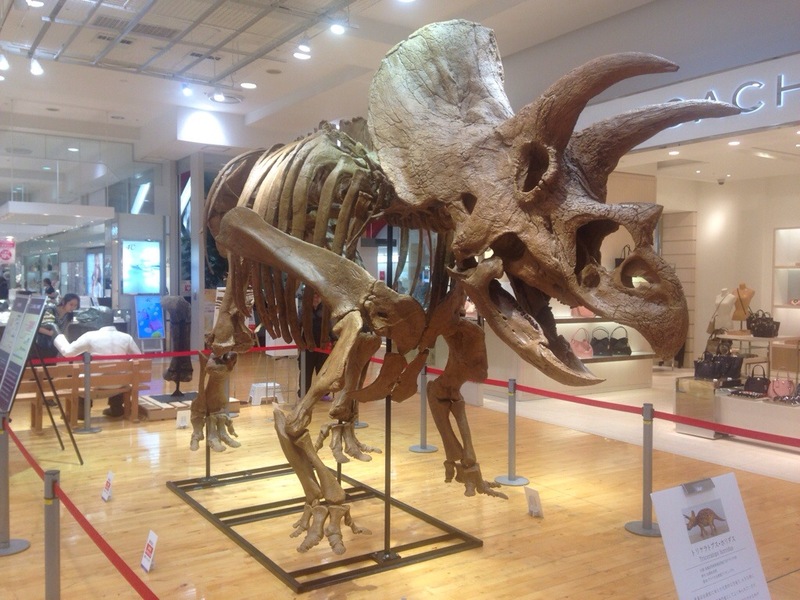 Our next skeleton was Japan’s own Fukuiraptor. It was a big raptor, one I wouldn’t want to run into. My daughter is 93 cm tall, just for reference. 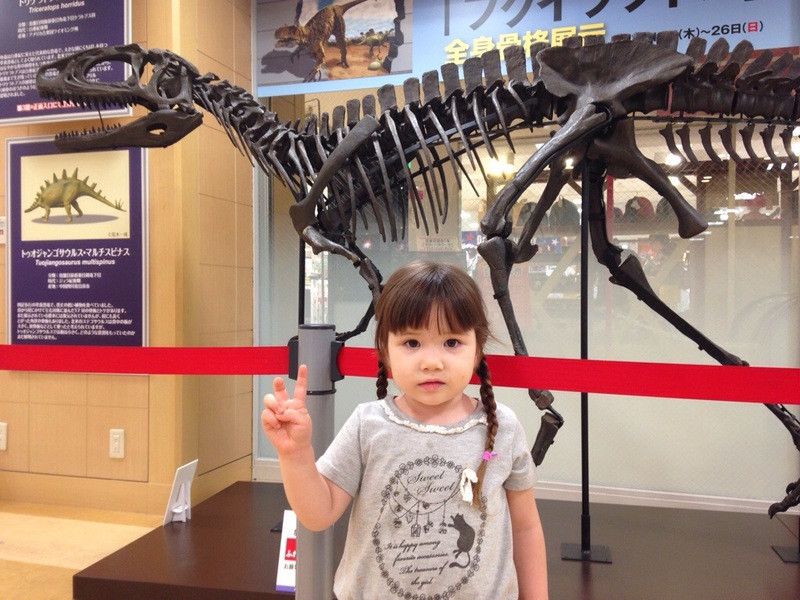 Fukuiraptor and my daughter. The dinosaur is the one without skin and musculature. Then we went down another two floors and found the next dinosaur. It was a big one! And it’s from western North America. It was a Triceratops. 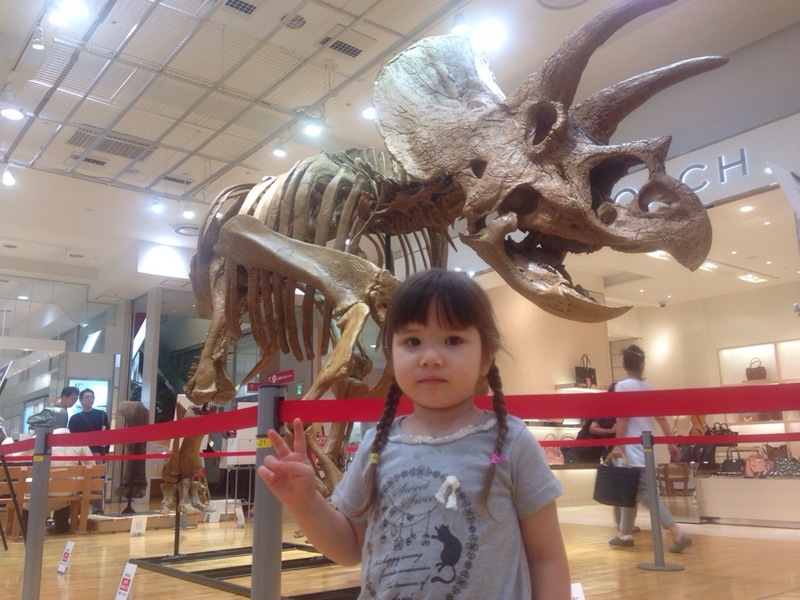 Again, my daughter in front of a dinosaur. This time, a Triceratops. Only the Triceratops with me standing this time. There was another thing to check out behind the Triceratops, the femur of an Apatosaurus. 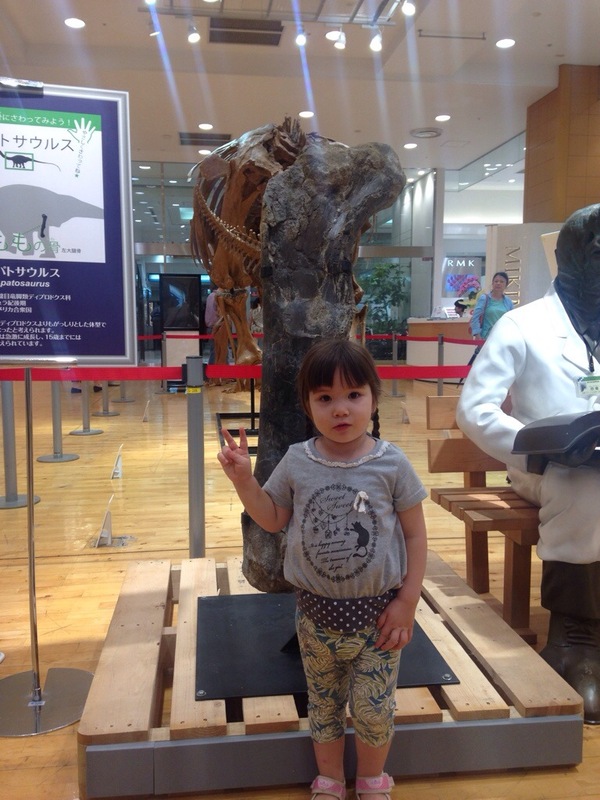 Apatosaurus femur and my daughter next to a dinosaur professor. But that’s not all! 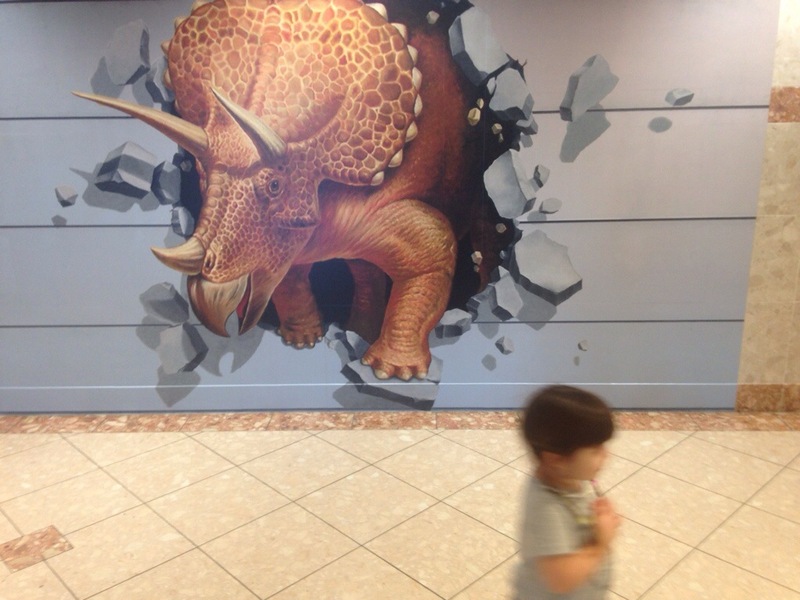 We found some dinosaur artwork on the same floor, a Triceratops bursting through the wall. My daughter was scared of it, and wouldn’t go near it. The blur is my daughter running away. Despite my daughter running away from the Triceratops picture, she enjoyed seeing the dinosaurs. Now she knows a new word, and I hope I have a big fan of dinosaurs. We’re moving to Alberta next year, which is one of the best places in the world to see dinosaurs. I hope she’ll love it. This comes straight from my home province of Alberta in Canada. It probably has the highest number of Creationists in Canada, as it’s the most conservative province, at least religiously. A Creationist from Calgary was digging in a basement when he found what is probably a completely new species of fish dating back to 60 million years ago. This is a problem. According to him, they’re only 4,500 years old. How does he know? Noah’s flood. He’s sure they were deposited there by the flood. This guy actually helped build the Big Valley Creation Science Museum. Creation Science. Something that contains not one bit of science. He’s also interested in having Alberta schools teach Creationism. He hasn’t directly asked the government, though. I have a problem with that. Creationism is religion. Public schools are secular. If anyone thinks that Creationism should be taught in science classes as an alternative to evolution, they are completely wrong about what science is. I would have a big issue if a science or biology teacher started teaching Creationism in class. But back to this discovery. This dates back to 60 million years ago, which is extremely significant. This was only a few million years after the K-T mass extinction, which wiped out non-avian dinosaurs and most other species. These fish lived in a time when life was recovering from the devastation of the extinction and asteroid impact. We know it’s this old because of several methods of dating, which all agree with each other (fossil record, palynostratigraphic, and magnetostratigraphic). It’s not 4,500 years old. At that time, Mesopotamia and Egypt both had civilisations uninterrupted by a giant flood. It didn’t happen. So, how can a great flood wipe out everything but a small group of humans and the animals of the Ark, yet the civilisations continued on without even acknowledging this flood? Sounds fishy. Oh yeah, Egypt started building pyramids around that time. He says that he has come to “accept the fact that we all have different opinions.” Too bad evolution and science are not opinions. They don’t care what people believe. They just are. If you go to my Knowledge page, you’ll notice there are three series there. In particular, I’d like you to check out Encyclopedia. I’m going to be changing this a bit. Instead of calling it Encyclopedia Entries, I’m going to make separate pages for different topics. They’ll still be under the Encyclopedia heading, but have their own pages. I’ll be continuing with the Moon series, but place it under the Astronomy heading. I’ll also be adding a heading for Geography, and I’m considering doing one for Palaeontology, focusing on dinosaurs, then other prehistoric animals. 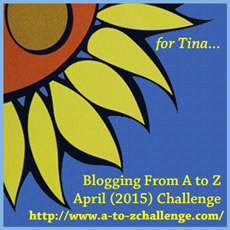 And the great thing is, I’ll be doing all of them in alphabetic order. No choosing favourites, just going through them all in order. The Moon series will still have basic information about each moon, an image, and five interesting facts. The Geography series will go through every country in the world with a lot of facts. Mostly statistics, including extremes, major city populations, and other facts. I’ll also have images for the flag, as well as public domain images or those available through Creative Commons for cities and major landmarks. After doing countries, I’ll do provinces, states, prefectures, etc. The Palaeontology series will start with dinosaurs, which was a big passion of mine when I was a kid. I’ll discuss where they’re from, when they lived, their size, all the scientific classification, and an image, if available. What are you interested in seeing? Anything above interest you, or is there something else you’d like to see? I mentioned before that I’ll be studying some courses through Coursera, a free online university course website. Well, I added one more. This one is Dino 101, which is a course about dinosaur palaeobiology offered at the University of Alberta (I went there for my first year of university) and taught by Philip Currie, who is one of the top palaeontologists in the world. For this course, I will mainly be watching the lecture videos, though I am unlikely to do all of the coursework. It’s a 12 week course, and I’m more interested in viewing the information, rather than doing all of the work. Not to mention, I don’t have the time to do everything. I’m really looking forward to it, though. Creating a new world is a big undertaking. Last summer, I talked about how I developed Ariadne using my knowledge and education in astronomy, as well as my interest in geography and geology. But what about the biological aspect? This is where my interest in palaeontology comes in. As a child, I was always interested in dinosaurs. I think that’s pretty common amongst children, but I went even further than that. I found a book in the library with detailed diagrams of the skeletons and skulls of most known species of dinosaur. I did my own reconstructions of the dinosaurs in pencil. I wish I’d kept up with the drawing, but I can always start again. And I will, actually. As I grew up, I had to make a decision about what to study in university. I chose astronomy. My second choice was palaeontology. To be honest, I think palaeontology would’ve been more useful, as it involves geology, biology, zoology, and more. If I could go back to university, it’s what I’d study. Using palaeontology to build a myriad of animals for Ariadne is something that fascinates me. How will I do it? I will start off by developing the basic Classes and Orders of animals, then splitting those up into Families and Genera. I don’t want to make the Classes identical to what we have on Earth, so I need to be creative. I can also attempt to trace back the evolution of the animals, which will give me a more realistic variety of animals. I will examine environments, adaptations, and even colours. Watching some videos of dinosaurs and other prehistoric animals has helped me develop some ideas for animals. Seeing the family resemblance between dinosaurs and birds is also quite helpful. The past and present give me a great insight into how to create new animals, ones that I hope will be truly alien. On my official website, I will be uploading drawings of the animals as part of the Ariadne Encyclopedia. You may even see some artwork of real animals on this blog in the future. I’m excited to get back into drawing. Who’s interested in seeing some of my artwork?